Fastest 5K- TMB and her new PR!! **Prize= Sticker "I know I run like a girl. Try to Keep up." **Prize= Sticker "Some girls chase the boys. I pass em." Super Story and CUTE shirts- Amanda, I must admit that her first paragraph sold me a little light flattery will get you everywhere. And anyone who makes a shirt for a Virtual Race is TOPS in my book.. Since she had a buddy, Michelle gets a headband too. Making a Difference Award- I loved MJ and her race report. She supported her 6 year old niece through a 5K. Inspiring the next generation of runners!! **many donated more than $15 THANK YOU! AMAZING!! 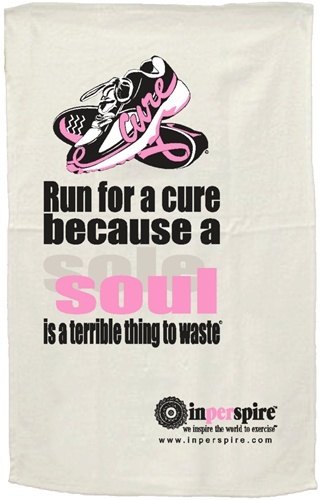 $450 to Susan G. Komen Marathon for the Cure. And Guess What??? With all of your help I have surpassed my $1,500 fundraising goal!!! Little dance in the living room, dimples shining.. 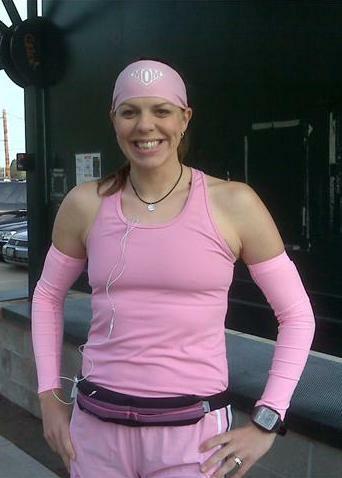 Many runners dedicated their donations to family and friends click HERE for more dedications. *Click names for Race report.. These ladies made awesome race shirts and raced in HOT weather. Speedy lady started the day not feeling like RACING, but came in within 3 seconds of her PR during a virtual race. Like many others Ashley was fitting the 5K into her weekly long run. Got an unofficial PR on a track with a tender foot. Let her daughter play and did not get out to run until 9....guess in Hawaii time is not a big thing. She is generally pushing a double jogger, AWESOME! 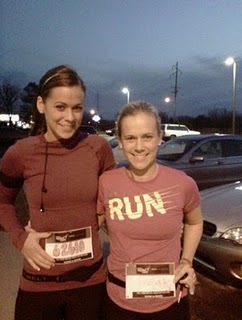 She ran her first 5K of 2010 and placed second in her age group!! CONGRATS! This lady decorated her bib and had a blast running her furthest run to date. Although I know she was bummed not to have the outfit and course she wanted she still rocked out the miles treadmill style!! Soon to be Running Mom enjoying a nice run for a great cause. This speedy lady makes hitting sub 7's easy!! You must check out the before and after pictures on this FUN post! A member of the Tall Mom 1,000+++ club plugging along in her miles. 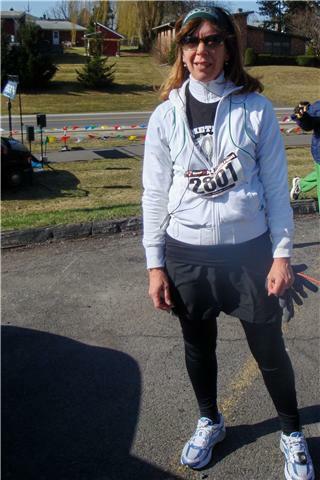 She also ran the Colon Cancer challenge. Love the post race raves and rants. My adopted little bloggy sister had a tough 20 mile race, she dedicated the first 10K to her mom and grandma both who beat breast cancer!! This lady is a Cancer survivor and a wonderful spirit. SURVIVOR!!! This lady knows how to set up a water stop and post race beer garden. Lucky Lady the race started at the end of the driveway! And she got a PR! Can't wait to meet this local blogger who is training for her first marathon with Team in Training. Running for our friend Lynette's grandma, her mom's friend's sister, and her husbands grandma. She ran the race twice and INSPIRED the next generation of runners. 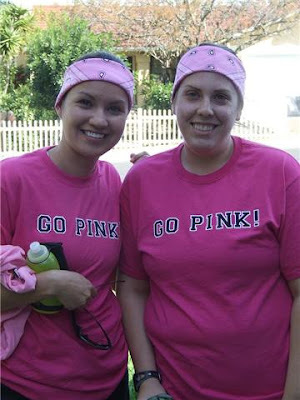 She ran in honor of her mother in law Diane, who is battling breast cancer, and her sister Cathy, who is a breast cancer survivor. Her pink shirt was awesome! Dedicating the miles to her Grandma, Irona Heitzmann, who battled breast cancer and is still going strong at 90 and in memory of Virginia Moore and Chris Tryon who both lost their battles but fought courageously and were amazing women. Can you believe that she got a 5K PR on a treadmill? Can you say awesome!!! 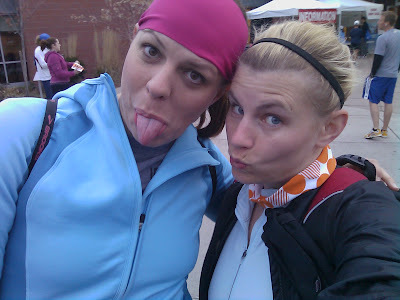 What is a Race Report without pictures??? I was BUSY playing photog all across the country, LOL! 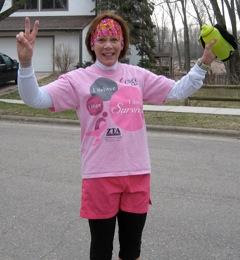 Thanks to all who emailed pictures..
Erica all decked out and ready to go!! Marlene's bib, pretty sure I have her addicated to 3's. The PRIZES will be announced tonight so check back!! Lots of fun things. Thank you again to everyone for making this Virtual Race for the Cure a SUCCESS!!! 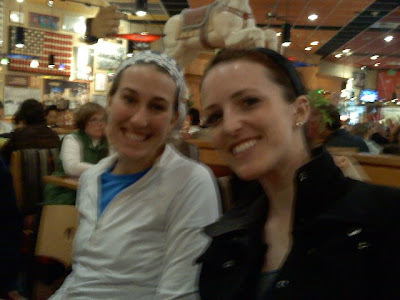 Welcome new Tall Mom Bloggy pack members!!! I am often asked how I can keep up with everything. 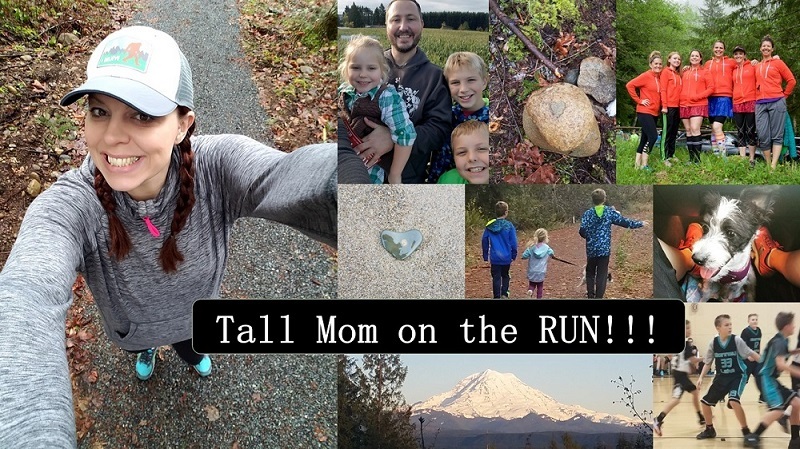 Working full time, running, being a wife and mom and Blogging. Well most times I can, right now fitting everything in is TOUGH!! So the Tall Mom Virtual Race for the Cure Results will be delayed a day as my Computer is acting up and my brain is TIRED :) Thank you for your patience!!! Overcast and cool day on the Orting trail with Janna and the Fleet Feet Training team. My Marathon Training plan called for 18 miles with a 4 mile tempo run at the end. I have been adding miles every week so I thought that a 20 milers with 3.1 tempo (aka Race for the Cure) at the end would be GREAT! Janna is training for her first Marathon and is a 40 year old ball of energy, I LOVE HER!! I finally felt my energy level back to normal and channelled my inner super hero with my outfit. What you don't see is my pink Asic Kayano 15's that I scored at Sports Authority for $75 with a coupon!!! Asics will cross the Eugene Finish line. It was overcast but I still ended up with a reverse farmer tan, too funny to have white arms and tan shoulders. The miles passed quickly while chatting with Janna and Paul, the owner of Fleet Feet. One of the coaches had Kazoo's at mile 2 and told us that if we could not get the Kazoo to work we were going too fast. Hmmmm...well we were talking the whole way so I don't think we were going too fast. Janna and I talked about how I was HOPING I had the steam for the tempo run at the end. She said that I should just go and she would keep up if she could. Around mile 17 she dropped her phone and I kept going, stopping is not good for me late in a LONG run. The mile chimed and I was OFF! I could see a few runners ahead of me in the RACE so my game plan was to pick them off one by one. My pace quickened and I saw 6:45 on my Garmin, "Way too fast, you will burn out!" So I slowed and was happy to see 7:45. "Keep it steady!" I was not tired, I felt like a machine, arms pumping as I sped easily past two women. Janna held strong to my left arm but I could tell she was struggling with labored breath. Around mile 18 there was a man 200 yards ahead, so I kicked it up and left my pretty little friend behind. First mile 7:45!! Head up, arms strong, legs quick, passed the guy... Hmmm no one else ahead of me, I am WINNING :) Then I saw the Rollerblader that we have seen many times on the trail, "Could I pick off a dude on blades?" Worth a try! As I crossed an intersection I saw a girl no taller than my elbow on a pink bike. I thought about all of the people who have donated to Marathon for the Cure and the AMAZING things that can come out of donations big and small. This little girl could get screened early and catch it before it rules her life or better yet this little girl could live in a world without Breast Cancer! IMAGINE!! By the power of my size 10's racing for the CURE!! Second mile 7:45. Oh I was getting tired, I could feel a blister forming on my right foot. My calves were on fire. Really my mind was tired, not my body. This was a HUGE CONFIDENCE BOOSTER!! I could see the roller dude but he would win today. The Finish was just ahead. The Fleet Feet people stood as I zoomed passed to get in the .1 . Last mile 8:07 and .1 in 7:25. ***For some reason I did not eat right away and was running around to get ready to go to the beach. LESSON LEARNED!! Eat or you will feel nauseous. I was car sick the entire 3.5 hour trip to the beach. ******I did not do my usual icing of my knees and calves. LESSON LEARNED! My legs were sore and I know it was mostly inflammation. I took a VACATION day to be with my family at the beach.. Tomorrow I will be back to tell you all about my 20.1 miler including the last 3.1 for the Tall Mom Virtual Race for the Cure. I am soooo pleased to have an inbox FULL of amazing pictures and links to race reports. I will have the report tomorrow including the PRIZES!!! In the mean time comment with your links so that others can check it out. What a HUGE success!!! I know there are more but I have 20 miles in the morning, so beauty rest is required. Plan called for 18, but I already did 18, so Lioness and I are going to tackle 20 FLAT miles... and you better believe I am going to be decked out in pepto pink for Tall Mom Race for the Cure!! Have fun with it people, you know I will.. I will be out of Bloggy land for the weekend. Things to do, people to see, cities to run, kids to play with, hubby to cuddle...etc... Wishing you all a WONDERFUL weekend! Back Monday with a Long run Recap and Tuesday with the Tall Mom Race for the Cure results and prizes!!! With the help of ALL OF YOU, friends and family I am at 89% of the fundraising goal for Marathon for the Cure!!! (Donation Page HERE) Less than $200 and together we will have raised $1,500 to support Breast Cancer research and early screening!! Truly AMAZING!! HIGH FIVE!! Yes I am a TOTAL POSER!! The paparazzi would either love or hate me.. This was mile 1 because I still had my toss-away jacket on. I spotted the photog and totally hammed it up :) It is easy to SMILE at mile 1..
Not sure which mile this was, probably after mile 9ish because I took off the bondiband. My racing outfit was pretty perfect for the day. Sugoi tights, Lucy Skirt, Brooks T-shirt and shoes, Balega socks, Moeben Arm Sleeves, Golite handheld, Ifitness belt, and bondiband headband. I am still torn on what I am going to wear for Eugene. Throw my arms up and glide across the Finish. This is one of my favorite Finish Line pictures so far. The runners around me are so serious.. Cracks me up. Ham it up at the Finish Line people, it is what you have been running to reach for almost 2 hours!!! Guess who is the "Follow this Mother!" 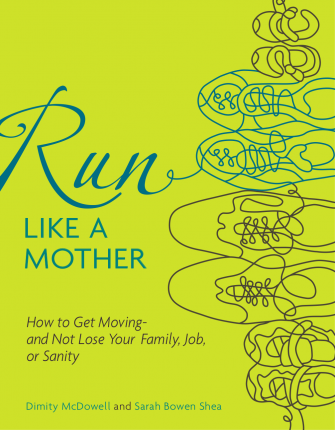 feature on the "Run Like a Mother" book website?? Hmmmmm.. Go to this link HERE to find out. Thanks to the lovely Sarah and Dimity for the feature. I plan to purchase my copy of the book tomorrow.. SO EXCITED!!! Did you know that there is a Book Tour?? To find out if they are coming to a city near you click HERE. For my local peeps mark the date on your calendar!! ***Tall Mom will be in attendance :) Seattle peeps who is in??? *Wonder if my boss would let me take an early lunch to run a 5K?? May be worth asking. I really try not to post twice in a day.. SORRY about that :) Guess what?? 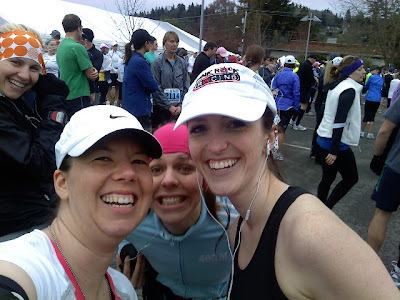 The photos from Mercer Island Half are in!! It is official, I am a total poser. Will post the photos tomorrow. Or if you cant wait feel free to click HERE. If you POSE for the photogs they will take your photo, just a little tip for any racers this weekend. The day after my hilly Half Marathon it may have been a little silly to PUSH it and do intervals, but I am desperate to get back on my training plan. So I did 7 miles with 3 mile repeats, I ROCKED this work out!!! 7:20, 7:12 and 7:28 interval mile splits!!! And a total of 7 strong miles. Tuesday I did not have my Garmin so AC (Alex the Canadian) and I went for an easy 4 miler. He has a BIG Hockey tournament this weekend and wanted to get his heart rate up. Due to vacations and work travel we have not been able to run together for well over and month. It was nice to get caught up and have some company on my lunch run. I was having an off day confidence wise yesterday..and I made it very public on Facebook and Dailymile. With 5 weeks to Eugene I am feeling tired and like I have not put in the miles to get my BQ! UGH!! I am generally so confident, but there are days when Polly Pessimism sneaks in. So I asked muscle Man to go for a run. The first mile chimed at 8:23, which is my BQ pace.. LOL!! If that is not a sign I don't know what is. Mental Block lifted and focus restored. It was 70's so I was testing an awesome Sugoi top. Can you believe that Spring has Sprung??? I thought it would be interesting to analyze my 3 Half Marathons. 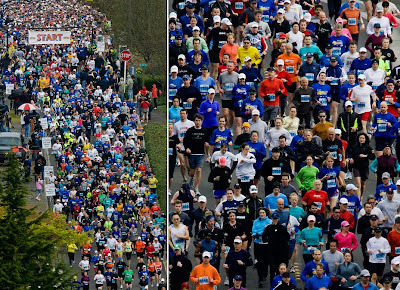 The courses for the 3 races were very different. The FUNNY similarity is that I do no have a Half Marathon medal, I need to start picking races with hardware. 1. We got the house!!! The inspection went great so now we WAIT... I am SOOOO excited, this has been our goal and I know the new house will be the perfect place to raise our family. This next month is going to be filled with paperwork, price shopping (Blinds, fridge, fence, etc) and MOVING!! The closing date is the week of Eugene.. Hmmm?? Is moving heavy furniture considered Taper? 2. I am still SICK! Cannot get this crud to leave my lungs and sinuses. I just want to be healthy and have my energy back. And I got the Little Studs and Muscle Man sick. 3. My Music needs an update. OK this is not that stressful, but I have had the same tunes since May of 09. And I am TIRED of the songs, I spend half my run hitting SKIP. Some of my Bloggy buddies have sent me CD's, thanks Ladies!! Now I need to find a couple hours to upload the FAST TRACK songs and revamp my Ipod. Just look at this start line!!! It was PACKED!!! One picture before the race that I did not get posted on my race report. LOL I sorta snuck in. I also forgot to mention that Janna (lioness) from my Fleet Feet training ran a PR at Mercer and beat me by less than 20 second!! 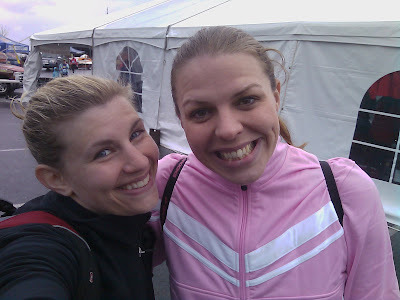 she wanted a sub 2 hour so we did not run together... UGH!! I crossed the finish line to no-one waiting for me.... this is VERY DIFFERENT!! Normally Muscle Man is there with a hug and a smile. I nearly fell over when I had my timing chip cut off then pulled myself together to go UPHILL to the food and water. I went to the North Side of the tent, not realizing the line was the other way... OOPS! Got an orange, bagel piece and grabbed a bunch of waters for my girls. Then I sat down to text everyone and get status updates. I was tired, beat up and LONELY!! Just then I got a text from Amanda with her time, she had done what I ALWAYS knew she could do!!! She got her coveted sub 2 hour PR and on her birthday!!! My forlorn tired attitude instantly turned and I was filled with JOY!! I stood up, turned to the tent and there was my friend.... Smiles, tears and one of the BEST HUGS I have had in a long time. It is amazing to know someone can do something, then be with them just after they have done it. We both cried and I was the first to say a heartfelt "I told you so!!" My plan was to pace her for this race, but she did not think she could do it so she told me to run my race. I think the truth was she NEEDED to do it alone. Amanda went to find her friends and little buddy and I headed to the Finish line to greet my girls. I had no energy to cheer. As I stood there so very macho, young and fit looking dudes were chatting. "I got a PR buddy I ran a 2:01." Running still baffles me, I am a mother of 2 and I just beat a pack full of macho, fit and muscle bound men, PRIDE SWELLED inside. Silly Charlie's Angel pose. Sarah wins for the cutest..LOL!! Darn SLOW cameras.. Oh well it is still FUNNY! It did not rain the entire race, bust just as we snapped the last photo it started to POUR buckets. So we all sprinted to change and meet up at Red Robin. Jill and I found a family restroom in the community center and got pretty, as pretty as we could be after a Half Marathon. 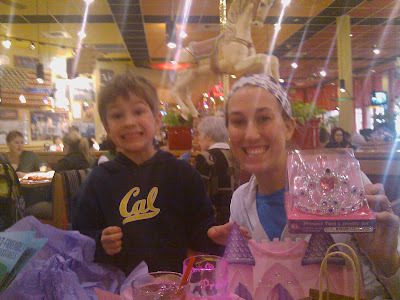 Red Robin and Princess PR opened her gifts from her little buddy. Love my Jilly.. I am a dork and totally forgot that we have known each other since Elementary school.. Hmmmm little Tall Mom and Jill photo to come very soon. I was STARVED but once the food came could barely eat. Birthday girl and pretty Zoe. We sat there for a couple hours and just chatted. We have a BLAST when we are together! 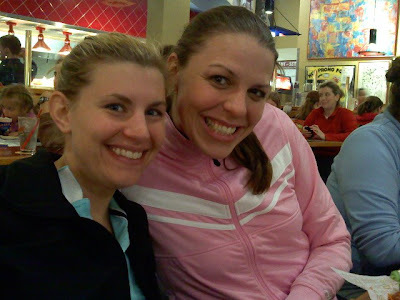 Kerrie and Zoe, they got there first and had fries waiting for all of us. SMART GIRLS!!! 1. When you get to a race and the bag check has no line, check your bag!! 2. 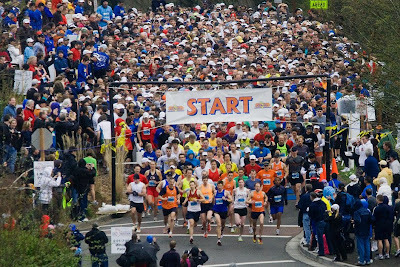 Next go look at the Start Line so you have an idea of the crowd and when you should get there. We stood around and made it to the PACKED start a couple minutes before the race. UGH! 3. Wearing less clothing is best because you WILL heat up during the race. I FINALLY got this right and was very comfortable. 4. Always warm-up because then you can make sure your shoes are tight enough and all gear is in place. My shoe was too lose and drove my CRAZY most of the race. 5. Wear a pace band if you are hoping for a PR. Doing Math while running is not easy. 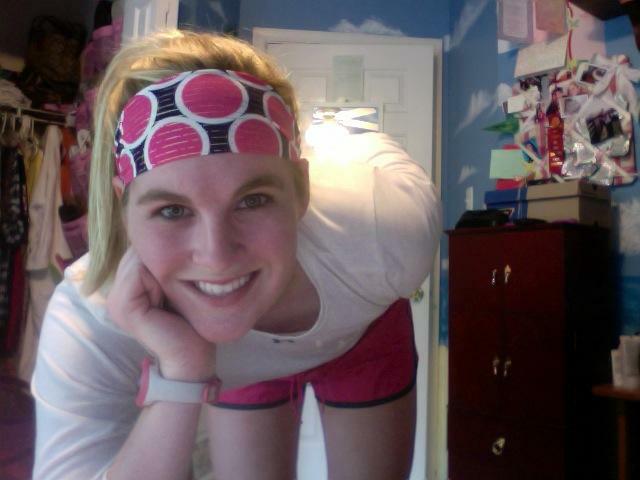 That is about all I have for now :) I had an AMAZING Interval run yesterday. Will tell you all about it tomorrow. Overcast and cool, very HILLY course, ran solo. Emails blasted back and forth with anticipation for RACE DAY! So many friends racing at Mercer. Jill (HERE) and I opted to carpool meeting at 7am. It was GREAT to catch up with Jill, we have known eachother since Junior High and planned our 10 year High School Reunion together in 2007. We arrived really early and putzed around (OOPS). While in the Honey Bucket line I hear "Are you Tall Mom." LOL!! It was Jen and Zach bloggy runners from Portland. 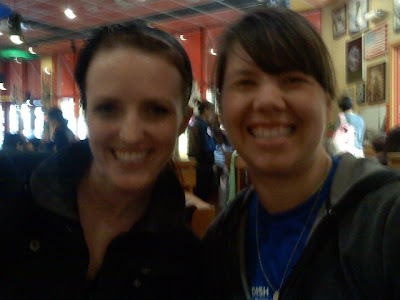 We stood and chatted for a bit, she is running Eugene for a BQ time!! So excited..course she has already run Boston so she knows what it takes. Then we found Kasey, Kerrie, Zoe, Cassidy, and Meghan, but never the birthday girl Amanda. She was smart and got to the line early..
We had to climb down a steep beauty bark hill and down off rocks to a PACKED start area. UGH!! Should have gotten there earlier. "I know I won't PR on this course, but should I try? Or should I run with friends for fun?" I did not have the answer until the race started. Generally I can remember pace by pace, but I was running this race on Dayquil hoping to avoid coughing fits of the "Black Lung." 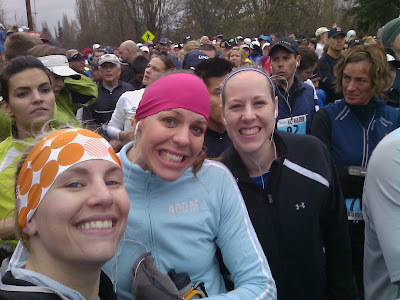 -I saw Megs and Cassidy and said a quick "Hi," that was mile 1 and I did not see anyone I knew the rest of the course. LONELY!!! -I was weaving and passing people left and right, probably not a smart move because I used a lot of energy, but the crowd would not open. -The course support was awesome saying GREAT things along the way. One volunteer looked me in the eyes and said "You look strong and beautiful!" WOW hello! That was an amazing compliment. They had water stops, a Gu station and many people keep the cars off the roads. Well organized event. -The views of the water were breathtaking, the green overgrown forests and Million++ $$ homes were not too shabby either. Overall running the ENTIRE ISLAND was a kick. -At mile 3 I realized my right shoe was too lose, it would drive me crazy the rest of the race. -At mile 6 there was a very muscular man in a tight black tank walking. He looked like a fitness model, amazing how appearances can be deceiving. -I took a Gu at mile 7 and proceeded to burp Gu the rest of the race. UGH!!! -HILLS, my goal is to be positive. And I am positive that I do not train on hills like this. My legs felt like led from mile 9 on. If you look at the topography of this course you will understand. WOWZERS. I heard someone after the race say it was harder than San Francisco. -From mile 9 on I also had to go pee. LORDY can I have a race without needing to urinate? -I knew there was a hill at mile 11. I was TRYING to do the Math on what pace I needed to run to PR. Math is tough while running. I knew I had to run sub 8's to PR. I also knew that I had hills ahead, was sick and running on fumes. At that point I gave up mentally on a PR. That in the one thing I am not proud of for this race. I think physically I could have done it, but I did not hang on mentally. -There were 2 women with LONG hair running with their hair down. PET PEEVE!! I had to pass them, that became my mission. UGH!! Really people? 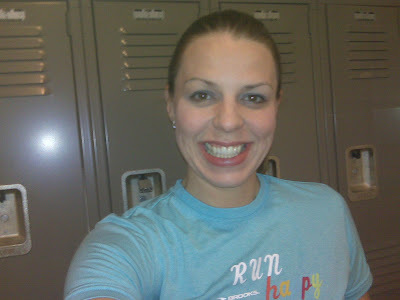 -The last mile I kept telling myself "4 laps around the track." That mile was SLOW!!! Felt like an eternity. I was ready to be done running. -I posed for all the photogs on the course, so I am hoping for a PR race pic, if there is such a thing. I ran across the Finish mats with my arms in the air smiling. -I did not look at the race clock, which is a first for me. In fact I have zero clue how I did according to the Race Directors. Hope to have stats and pictures for my Lessons Learned post later this week. -Cut my chip and walked Up-Hill (REALLY?) to the water and food. I downed a water and oranges, sat for a minute, went to get my bag and texted everyone!!! I then got my bag, and stuffed it with water for my girls. POST RACE REPORT COMING SOON!!! We met our Realtor this morning. We got a full price offer on our house and accepted. So we set out to find new Tall Mom digs. 6 houses later and we found the one. I have always wanted a Yellow house. And we found a 2,800sqft blank pallet ready for us to upgrade as we wish. We put in a strong offer. Now we wait. I quickly logged on to Blogger to find that I WON the Raffle I have been telling you all about over at Katye's Blog HERE. I could not be more excited. The Pink Ipod I have been hoping for and the money goes to a good cause. And guess what?? You can still enter for round 2!! So go check it out, buy a Bondiband and enter Raffle #2. This busy anf fun day continues as Muscle Man and I head to Mercer Island to pick uip my packet and drive the course. Then we are going out to dinner and to the Gonzaga Women's Basketball game. Friends and Family I have not seen in ages will be at the game. Good Times. Oh soooo many Self-Fives for Tall Mom today!!! 1. Last night we got a call during dinner that someone wanted to see our house at 7:15. Muscle Man and I sprang into action, making the house is tip top showing shape. Trouble is that Little Stud #1 was feeling sick.. UGH!! Turned on all the lights, opened all the windows, and headed out. We killed time running errands, then drove back half hour later but they were still there... hmmmm?? Could be a good sign. So we drove off and Little Stud #1 proceeded to upchuck in the car, LOVELY!! We went to Fred Meyer to get out of the car and I got a text from our Realtor. They LOVED the house and will be sending an offer tonight!!! Wish us luck that the offer is good and that we can FINALLY start our house hunt. 2. My lovely older sister Jayne has always been sizes smaller than me. However, through running and weight loss I have bridged the gap. She kindly gave me a size medium dress from her closet and I am happy to report that I am wearing it PROUDLY today. THANK YOU RUNNING!! 4. 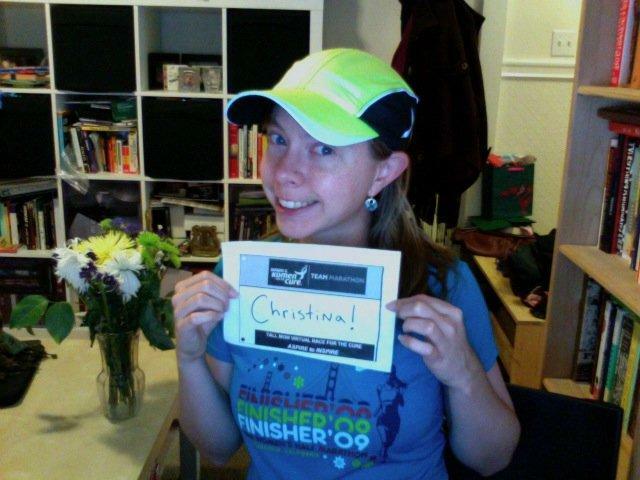 I am EXCITED to run the Mercer Island Half on Sunday. My Race Plans are still a little TBD, but you will find out more on Monday after the race report..
5. This weekend will be Gonzaga Women's NCAA Basketball Game, House hunting (hopefully), 1/2 Marathon, and lunch and b-day celebration with Bloggies and buddies.. Oh sounds soooo good!!! Shawna- Ran the Rock N Roll Dallas Half Marathon in 1:57:02, this was her first sub 2 hour half and an over 14 minute PR!! Tricia- One More Mile ends ? Katye- Raffle Fundraiser for Leukemia and Lymphoma Society ends 4/1 ***Please tell Katye I sent you, I could REALLY use a new Ipod!! Since I have only 3 minutes to rub together today...I am going to use my favorite Redheads format. 1. I FINALLY ran yesterday. Not fast and I did not have my Garmin so I am unsure of the distance. After dinner Muscle Man and I pushed the kiddos for about 4 miles. I COUGHED and COUGHED, it was gross! My legs felt strong but my respiratory system was hurting. I am glad that I was able to get any miles in as I am STRESSING about missing training runs. My training has been derailed since my business trip and this sickness. I only hope I can get back on track so that my BQ dreams can become reality. 2. Wow oh wow thank you for the Blogiversary Wishes and the support to Marathon for the Cure. With the help of YOU, friends, family and Co-workers yesterday alone $174.66 was raised for Susan G. Komen. This puts me at 74% and only $396.34 to raise. Hugs to Heather, Stacie, my in-laws, my boss, TMB, Aron, Bethany, Alicia and Marlene!! 3. Meet Penelope the Porcupine. She lives near a cabin high atop the snowy mountains and snacks on food scraps from passers by. I met her while in Colorado and it was a highlight of the trip. Can you believe that people have actually tried to pet her?? **Only a few more sleeps to my first race of 2010!!! That is right folks Tall Mom is 1 Year old today!!! 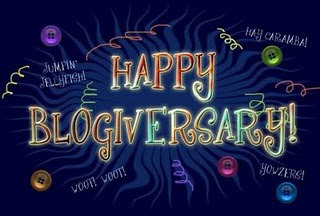 I racked my brain to think of what to write about on my Blogiversary. Well my brain is foggy with cold pills so the best I can do is a list. But I know you love lists so here I go. To some of you many of these things you may already know, but for new readers lets get to know Tall Mom. 1. I played Basketball and graduated from Gonzaga University. My lady Zags are in the NCAA tournament in Seattle on Saturday!! Date night, yippee. 2. My Grandpa Ernie was a professional baseball and semi-pro basketball player. If he were alive today I know he would be very proud of me. 4. Muscle Man and I met on Match.com. 5. Both of the Little Studs were born before their due dates. 6. I believe that a bad day can be turned around with a Jamba Juice and a hug. 7. I am 30 and proud of it. I ran my first Marathon 12 days after my 30th birthday. 8. Growing up my stuffed Manatee went with me EVERYWHERE, however real Manatees scare me a little. 9. My dimple is a distinct feature that I am love. Both the little studs have dimples!! 10. Reality TV is an addiction that I wish I could kick. 11. My parents totally ROCK!! They supported me by funding and attending all my sporting events, helping me with my homework and making sure I always had what I needed. They are AMAZING grandparents to our Little Studs. 12. If I have chocolate, or any dessert, I need MILK. Always have. I love milk. 13. I am 6'0 tall and have always LOVED being TALL. 14. If I could wear a hooded sweatshirt and jeans every day I would. 15. I do not like being barefoot. I prefer to ALWAYS have socks on. 16. Crooked frames hanging on the wall drives me mad. I have a compulsion to straighten the frames, even when it is not my house. 17. Our boys are VERY different from each other and have been since before Little Stud #2 was born. 18. Little Stud #1 is in a phase where he likes to wear costumes, he just asked me "Mommy does Wolverines muscles look big?" 19. Little Stud #2 prefers to hang out in his diaper and CRIES when we put clothes on him. 20. Our House is for Sale and I cannot wait for it to sell so that I can SHOP for the perfect place for our family to grow. 21. This number makes me think of my Buddy Kiera!! Kiera and her hubby hosted my 30th birthday party and were the driving force in our trip to Hawaii. 23. I prefer white cake to dark and vanilla ice cream to chocolate. 24. My game high for Basketball is 40, our family record is 42 set by my cousin Kathy... Oh so CLOSE!! 25. I set up a Facebook Page for Tall Mom HERE but have not talked about it because I have not had time to get it right. Don't Judge :) Become a Fan and you will get up to the minute Race info after the Mercer Island Half. 26. 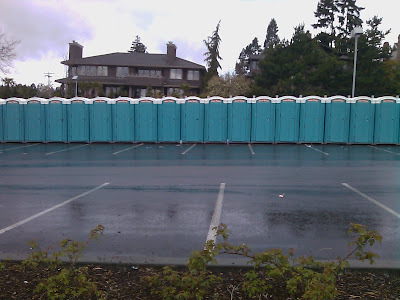 Before Races I get so nervous that I have to visit the Honey Bucket (Porta Potty) Multiple times. I should basically just stand in line until the race starts. 27. I love Canada and Canadians. Muscle Man asked me to be his wife on Canadian soil, it was the PERFECT moment. 28. I am Weather Woman with the power to knock down Wolverine with my wind and lightning blots. BE AMAZED!! (LOL, it is fun to make lists and play with the kids at the same time). 29. I have many many Goals, including qualifying for Boston, writing and publishing a book and owning my own business, to name a few. One of my WORST fears is not reaching those Goals and becoming stagnant. 30. The Eugene Marathon is getting here too quickly but also cannot come fast enough. My training, until the past 3 weeks, has been AMAZING! Until I cross that Finish Line I have no idea what I am capable of in the Marathon. 31. I would love to get a Blogiversary gift from ALL of my readers a donation in a denomination of $3 to the Marathon for the Cure HERE. ($3, $33, $99, $120, you get the idea) Pretty Please :) Huge Thank you to ALL who have donated so far!! 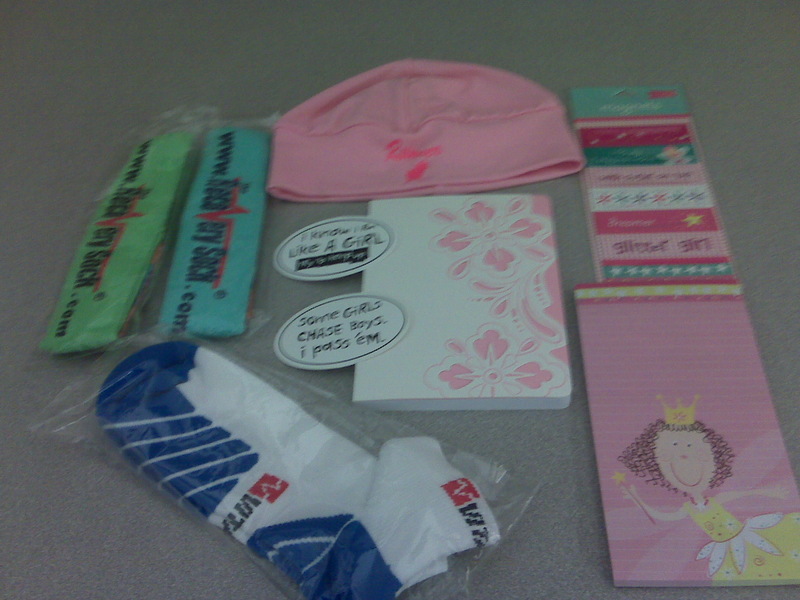 BIG hug to Breast Cancer Survivor who recently donated to the cause Linda HERE. 32. I LOVE my husband more than words can express. We are blessed to have found each other, like a puzzle with the perfect fit. Yes he pesters me to no end, but laughter is what keep things FUN. He is my best friend and one of the key reasons that I can RUN. 33. Hard to believe that it has only been 1 Year! I have learned so much from this virtual community. Been blessed by wonderful companies. And worked my tail off to reach some amazing goals for a once overweight Mom of 2. Thank you to EVERYONE who has read even 1 word that I have typed. I am still amazed to have grown a following of so many Bloggy Pack Member friends. I look forward to meeting many of you in the near future!! Time to blow out my Candle and Make a WISH... Of Course I can't tell you what my Wish is or it won't come true (forgot to mention I am superstitious). What do you WISH for Today?? Will Running today make me better or worse?? Who knows?? But I am zapped so I am going to take one more rest day and hope for the best. Today is the day I dedicate to all things I review.. The History Channel has a gem of a show all about "Pickers." What are "Pickers" you ask? Pickers are people who dig through houses, barns, yards, estates, etc to find antiques or items of value. 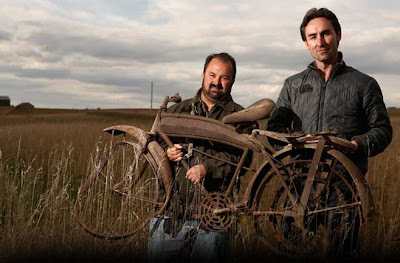 During my sick day there was an American Pickers Marathon and I sat glued to the TV. The show is mildly entertaining with the main characters driving an over-sized van and making contact with "collectors," hoarders, and strange old men with long beards who have STUFF. These people have so much JUNK it is unreal!! One man had been "collecting" for 30 years and had 5 acres and countless outbuilding FULL of stuff. And some of them will not even part with a piece of rusting old bike frame for $$$. WEIRD!! It is a History lesson and Psychology class all wrapped into an hour. Check it out! This could really fall under the eating or running category. I am a Gu Chomps girl, but with so many talking about Shot Bloks I had to give them a try. 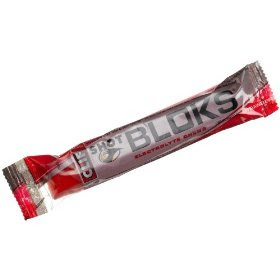 I tested the shot bloks during my Volleyball game, I avoid trying new thing son the run in case my stomach does not approve. The Strawberry flavor was tasty. I did not like the sticky consistency because the chews stuck to my teeth. I also did not notice the energy boost that I feel once I have a chomp. Overall I give these a "B." Gu Chomps are still my favorite, but since Shot Bloks are more widely available they are not totally out. The wonderful folks at IFitness sent me a belt to "Test". It is black with pink details. I went all out and wore it on my 18 miler this weekend!! Yes 18 miles of test lab fun. Water resistant double pouch will keep your iPhone or Blackberry safe from rain or sweat. A second pouch will keep your energy gels or keys, separate from your phone. An inner pocket will hold your ID and credit cards safely. 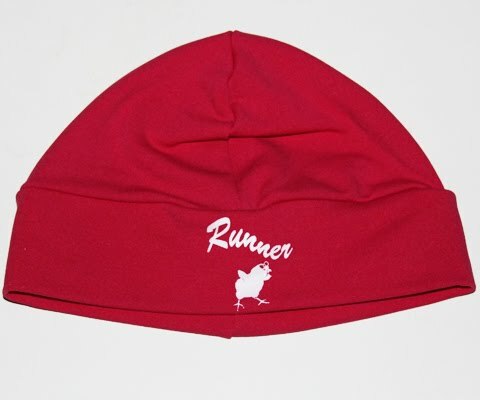 Two reflector strips in the front for your night time runs. This belt will not bounce, chafe or ride up while you run. At $26.95 this is a GREAT value!! I love the 2 pocket concept. I used one pocket for things I would not need while running, Key, phone, ID, money, etc. And the second for Gu, Chomps, Chapstick, etc. Although this time of year most gear has pockets in the Spring and Summer months this belt will be a savior. It did not ride up, I hardly noticed I was wearing it. Comfortable!! VERY COOL!! Ps. 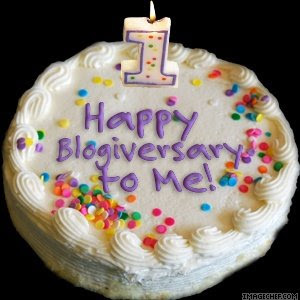 Tomorrow is my 1 year Bloggiversary!